The year 2018 saw many changes in Chelsea as the city tried to balance prosperity with priorities all year long. While new investment poured in, residents struggled to stay in the city and schools grappled with budget cuts. Meanwhile, public transit increased substantially in a positive direction with the introduction of the new Silver Line service. • Flooding becomes a major issue after a Jan. 4 blizzard and a March 2 storm, both of which occur during substantial high tides. The Jan. 4 blizzard caused a huge storm surge that flooded many parts of the city and even shut down operations at the Chelsea Street Bridge. • The New England Flower Exchange celebrates its first Valentine’s Day holiday at its new location on Second Street after being in Boston’s South End for the past 50 years. The new facility has been brought online seamlessly. • Wynn CEO Steve Wynn seemed to be in control of his company and the project in Everett until late January, when he was accused of sexual misconduct in a Wall Street Journal report. The allegations quickly gathered steam, and by February Wynn had resigned from the company and the license for the Everett casino was in jeopardy and the project to be moving forward “at risk.” The new CEO became Matt Maddox and the company saw huge amounts of turnover throughout the year. By the end of 2018, the license for the Everett site was still in limbo and an investigation into the matter still had yet to be revealed – having been delayed for months. • City Manager Tom Ambrosino says in his State of the City on Feb. 26 that now is not the time to save up money, but rather the time to continue investing in the City and its residents. He announces several key programs for the upcoming year. • Sen. Sal DiDomenico is involved in a heated and intense bid for the office of Senate President over several months, but in the summer comes up just short in getting the votes necessary to prevail. Sen. President Karen Spilka gets the nod instead, but DiDomenico remains the assistant majority leader and ends up coming out of the battle in a very good position of leadership. • Students at Chelsea High stage a walk-out in regard to school safety and school shootings on March 15. Despite lots of snow, thousands of students take to the Stadium for the one-hour protest. •YIHE company returns to the City with a new plan for the old Forbes site in the Mill Hill neighborhood. They start the process in April with a scaled down version of their previous plan, but reviews of the project continue throughout the year and into 2019. • The new Silver Line SL-3 service debuts on Saturday, April 21, in Chelsea. The service starts out a little slow, but by December the MBTA reports that ridership has exceeded its estimates. • The Chelsea Soldiers’ Home secured a $70 million budget item from the federal government in April that allowed the replacement of the Quigley Hospital to move forward. The Community Living Center has a groundbreaking in the fall and construction is ongoing in the new year. • The Chelsea Walk is transformed throughout the spring, summer and fall in a unique placemaking partnership between the City and GreenRoots. At the end, there is a new mural on the Walk and more activity. New things are also planned for the Walk in 2019. 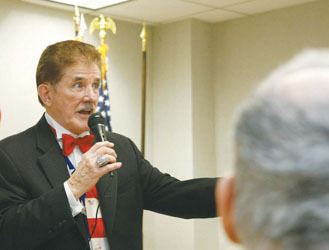 • A $3.1 million School Budget gap hits the School Department hard, with numerous cuts reported to key school services. Th School Department, City and state grapple with the issue all summer long, but no resolution to the issue emerges at the end of the legislative session. The school funding fix is still outstanding, and no fix has yet been passed to help districts like Chelsea, who have been penalized mistakenly by a new formula. 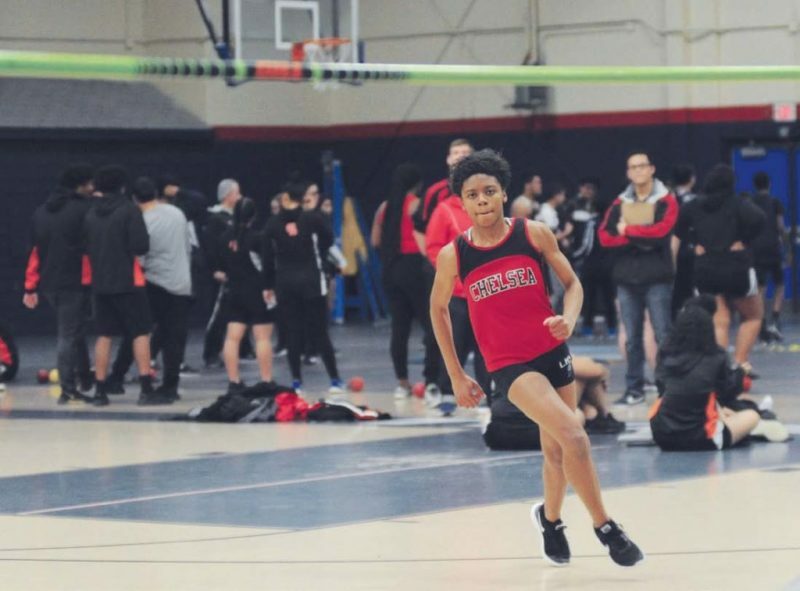 • Chelsea High sophomore track star Stephanie Simon caps off a stellar year by heading to the National Track Meet in North Carolina over the summer. She placed 15th in the high jump and 27th in the triple jump out of a field of athletes from around the nation. • Students at the Clark Avenue Middle School are ecstatic to return to school on Aug. 29, and that’s because they were able to enter their brand new building for the first time. The Clark Avenue premiered to excited parents and students for the new school term after many years of construction. • The Sept. 4 Primary Election features many surprises, but the biggest headline of the night, however, was when Boston City Councilor Ayanna Pressley upset sitting Congressman Michael Capuano decidedly. Capuano had campaigned hugely in Chelsea, and won here with 54 percent of the vote. However, a strong Boston turnout propelled Pressley to an big win. Pressley also had notable support in Chelsea from Council President Damali Vidot and School Committeeman Julio Hernandez. • The Two-Way Broadway proposal gathers steam, but fizzles out as residents and elected officials protest the change vehemently. That came after a late-August approval of the plan by the Traffic Commission. However, in September, it fails to get past the City Council. Broadway will remain a one-way street. • Supt. Mary Bourque surprises most in late December when she announces she will retire at the end of 2019, pledging to help the School Committee with a new superintendent search throughout the year. Down in the Back Bay’s Park Plaza, hundreds of National Grid gas workers – now locked out of work for 11 weeks – took center stage on what many said was the truest example of what Labor Day should actually mean. For Everett’s Rocky Leo, who appeared with about a dozen locked-out Chelsea workers recently at a Chelsea City Council meeting, the lockout has a human angle – and standing tall in the Back Bay on Monday, he said that is exactly what the company is trying to exploit. The lock out started earlier this summer during contract negotiations with two unions in the National Grid gas operations division. The unions are represented by the United Steelworkers and talks have been ongoing, but nothing has been fruitful and labor leaders seemingly – on Labor Day – had seen enough. Joe Buonopane, a president of one of the locked out unions, said on Monday that he wanted Governor Baker to stand up for the workers. On Sept. 4, National Grid and the two unions were to come back to the bargaining table. The results of those meetings were not reported by press time, but National Grid said they wanted to resolve the lock out. National Grid said they wanted to have a fair contract, but that also meant being responsible to the ratepayers. They said what the union characterize as a drive for company profits at employee expense is actually an effort to preserve reasonable rates for customers in Chelsea and beyond. If last year’s fidget spinners were all fun and games, this year, the national attraction is rather different: JUUL, an e-cigarette device that has become so synonymous with vaping and accepted by the masses, that the term “juul-ing” has been coined. Unlike the past forms of bulky e-cigarettes, JUUL proposes a completely different design: a small, USB-like device that comes in a variety of colors, skins and flavors. Its convenience has won over the e-cigarette industry, now claiming about 70-percent of the market share, according to a study by the Campaign for Tobacco-Free Kids. Juul Labs says that the device is designed to help adult smokers transition out of their cigarette addiction, but if you think that JUUL devices won’t reach the hands of the youth, that’s a grave mistake. An estimated 11.7-percent of high school students and 3.3-percent of middle school students were e-cigarette users in 2017, according to the National Youth Tobacco Survey. That’s more than 2.1 million youth. The stats are seemingly increasing over time. According to a 2018 study by the Truth Initiative, nearly one-fifth of youth, ranging from 12- to 17-year-old, reported that they had seen the use of JUUL in their schools. There are several concerns: For one, while JUUL pods contain nicotine. The greater issue, perhaps, is the lack of awareness on the issue. A study from Truth Initivative found that 63-percent of 15-to-24-year-old JUUL users did not know that JUUL always contains nicotine. JUUL has been a particular subject within Massachusetts, where the State Attorney General Maura Healey launched investigations into Juul Labs for failing to prevent minors form purchasing its products. Damaris Gonzalez with her granddaughters, Solmariz and Charlize,enjoying the evening during National Night Out on Tuesday, Aug. 7. Nationally, it was the 35th anniversary for the event. 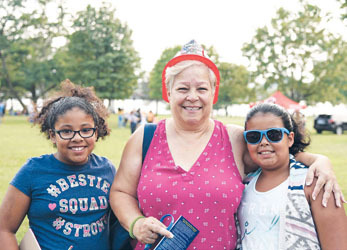 This year, scores of community members came out to celebrate the event at Mary O’Malley Park on Admiral’s Hill. Ocean animals don’t always draw national attention, but once every year, they become a media sensation. That time of the year is back. First aired on July 17, 1988, Shark Week returned to Discovery Channel this week to celebrate its 30-year anniversary. The 10-show lineup launched with a bang on Sunday, starring the week’s host Shaquille O’Neal and UFC Hall of Famer Ronda Rousey, among others. O’Neal made headlines, when a small shark entered the former NBA star’s protective cage, forcing him to get pulled out of the water. Shark Week will have featured 26 shows in all, when the two-hour special of Naked and Afraid of Sharks run on Sunday, July 29. But as visibility of white sharks have seemingly increased in recent years, one must wonder if sharks are as great a threat as Shark Week makes them out to be. People should still be careful around sharks, but the likelihood of a fatal shark attack is fairly uncommon, LaCasse said. In fact, the last fatal shark attack in Massachusetts happened in 1936; the last non-fatal shark attack was in 2014, when two kayakers safely escaped a great white shark that bit their boats. LaCasse said New England has always been home to a small population of white sharks, but with seals under the protection of the U.S. federal law, population of seals, the preferred prey of white sharks, have increased drastically in areas including Chatham and Monomoy National Wildlife Refuge. “Over time, all those white sharks [Massachusetts has] that were dispersed throughout New England are concentrating around the elbow of Cape Cod because that’s where their food is,” LaCasse said of the increased visibility of the white sharks. “If you’re going to the outer cape, the thing that hurts most people are other people,” LaCasse said. This won’t be the only time this summer will feature sharks on air, as The Meg will be released in theaters on August 10. The film is based on Steve Alten’s 1997 science-fiction novel, Meg: A Novel of Deep Terror. The film features Jason Statham, Rainn Wilson and Ruby Rose. Despite the name’s similarity, The Meg is unrelated to the 2004 horror Megalodon or the Megashark franchise. Since the founding in 1978, nurses have helped to make the time of advanced illness dignified and meaningful for patients and their families. We welcome new members to our team of caring, compassionate nurses. Visit www.CareDimensions.org/careers to learn more. Care Dimensions is the largest hospice and palliative care provider to adults and children in Massachusetts. As a non-profit, community-based leader in advanced illness care, Care Dimensions provides comprehensive hospice, palliative care, grief support and teaching programs in more than 90 communities in Eastern Massachusetts. Celebrating 40 years of service, Care Dimensions was founded in 1978 as Hospice of the North Shore, and cares for patients wherever they live – in their homes, in skilled nursing facilities and assisted living communities, in hospitals, or at our two inpatient hospice facilities (the new Care Dimension Hospice House in Lincoln, and the Kaplan Family Hospice House in Danvers). To learn more about Care Dimensions or to view a tour of our hospice houses, please visit www.CareDimensions.org. More than 500 Chelsea High students walked out of class on Thursday, March 15, as part of the national school walk-out movement to promote more efforts towards school safety. Armed with only a megaphone, students marched into shin-deep snow and cold temperatures to participate in the movement locally, and to draw attention to school safety. They were supported by the Chelsea Public Schools and the Chelsea Police, who stood in solidarity with the students, who ranged in age from 13 to 18. Student Eric Lazo entertained the crowd with impromptu chants and songs on the megaphone, for which most everyone in the crowd followed. Junior Angel Vargas said he and many other students are concerned that they could be next, that the fear of something at Chelsea High is real. Students cheered loudly, hats and scarves wrapped tightly around them, and then broke into a solemn moment as Rodrigues read the names of the 17 students killed in Florida on Feb. 14. The national walk-out day was supposed to occur on March 14, and all over the state and country students staged walk-outs to call for more gun ownership restrictions and more funding for mental health services inside and outside of school. In Chelsea, the effort had to be postponed because of the blizzard on March 13 that cancelled school for two days. Originally, the plan called for Chelsea students to have their walk-out in the school gym to avoid having to go in the snow. However, Rodrigues said she and Estrada were approached by students who said it should go on outside. Outside on Thursday, students carried signs that made many different statements. Some depicted an anti-gun message, while others called for funding to help people who are mentally ill. Some signs blasted the National Rifle Association (NRA) and others called for remembrance of the Florida students. Rodrigues said it isn’t an overreaction in Chelsea. She said students and adults are concerned about their safety in school, and it’s something that is a bit new. 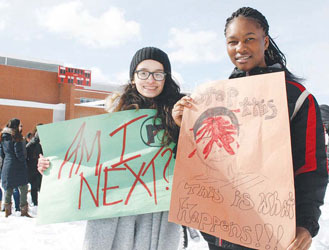 Stephany Villatoro and Masireh Ceesay were two of about 500 Chelsea High students that participated in a walk-out for school safety on Thursday, March 15. Students said they came together because they were scared that one day they could be school shooting victims. Nancy Baguada and Mauricio Rubi march through the snow to the walk-out. Co-Organizer Stephanie Rodrigues fires up the student crowd at the Stadium with a megaphone. Student Erik Lazo shouted out interesting chants and songs during the walk-out to get the crowd fired up. Imane Rharbi said there can be no more school shootings. She said now is the time for stricter gun control. Students rally on the Stadium field in the snow. Junior Angel Vargas signs the petition from Chelsea High. Student organizers standing with Chelsea Police Officers. Chelsea Police and Chelsea High security provided a safe perimeter for the students during the walk-out.